At some point or another, I’m sure you’ve seen a leather sofa with a big, sagging indention in the owner’s favorite spot. Want to be sure your furniture never looks like that? Here’s some info on why it happens and what to do to prevent it. We’ve also included what to do if your leather chair is already sagging. The main cause of sagging is that the leather isn’t getting the support it needs from furniture’s foam. Leather stretches naturally, so it needs a firm foam base to support the people’s weight without sagging. 1. It’s a good idea to buy couches and love seats that have several same-sized, removable cushions so you can switch them around periodically. That way, the cushions are worn more evenly, and your favorite spot won’t start to sag as quickly. 2. The denser the foam is in the leather furniture you buy, the longer it will last before it starts to sag. So, if you prefer stiff-looking leather, you might want to go in that direction. However, keep in mind that many people think furniture with squishy foam is more comfortable than furniture with firm foam. You have to find a balance and consider your own priorities. 3. Is more expensive furniture better? Unfortunately, the answer to that question has to be frustratingly vague. More expensive leather is pretty much guaranteed to have nicer, better made leather. But, more expensive leather does not necessarily have nicer foam. Some high-end furniture retailers ensure that every part of their furniture is top quality, and other cut costs on foam. Keep in mind that some high-quality leather furniture is intentionally made to be very soft, squishy and comfortable. So, even though you pay the high dollar for a nice piece of furniture, choosing the comfy, squishy foam may mean that you have some sagging down the road. The best thing you can do to avoid sagging seats is to distribute the use. If you have furniture with cushions you can move, switch them out every couple of months. If you don’t, try not to sit in the same place all the time. 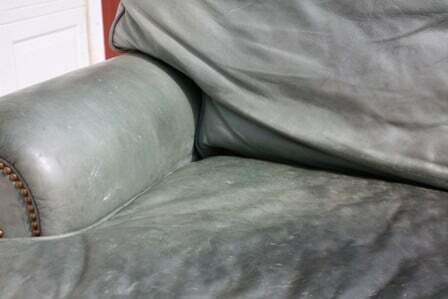 If your leather furniture is already sagging, your best bet is to get new filling put in it. The cost will vary depending on the size of the furniture and the extent of the problem. If you have any questions, leave ‘em in the comments! If you want to show us a photo of a specific piece of furniture, post it on our Facebook wall or get in touch with a franchisee.